A year ago I posted an article defining the terms mission, objective, strategy, and tactic. It’s a piece I’ve often referred back to when I want to explain the difference between these terms, but I realized we were missing a condensed version. I wanted something I could print and put up at my desk so I could see the main ideas at a glance. This realization brought about two results: A detailed table, and an infographic representing the elements in a hierarchy. It’s up to you to decide which version you’ll post at your desk! Why? Why the company exists. What you hope to accomplish this year. 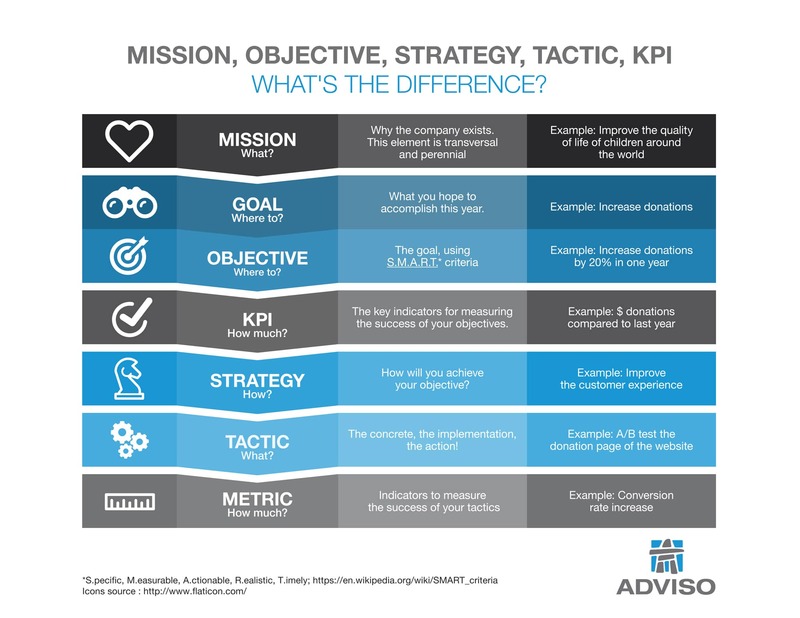 The key indicators for measuring the success of your objectives. How will you achieve your objective? The concrete, the implementation, the action! As you can see, I added in details like scale (omni-channel/channel) for each item. Today, it’s no longer relevant to come up with separate channel strategies, since consumers don’t differentiate between channels. If the experience is bad in one channel (web, store, radio ad, call centre call…) it’s the overall brand image that’s affected.Scale: Think omni-channel! In terms of defining objectives though, it’s up for debate whether they should be defined with an omni-channel approach, or channel by channel. Digital, for example, might contribute to part or even the entirety of an objective. For instance, imagine three merchants, each of whom earns $10 million in online sales. Merchant A makes 60% of its sales through digital channels, while merchant B makes all its sales online, and merchant C only makes 3% of sales online. Even though their online revenue is the same, and they share a common business goal (generate online sales), these three merchants probably have very different digital strategies, tactics, and objectives. A company’s business objectives might equally be broken down into campaign objectives and web objectives. The ideal still being to keep an omni-channel perspective for as long as possible, in order to keep things coherent. The ideal is to design the strategy and tactics around the goals and objectives of the company. But in working on marketing plans and strategic planning for redesigns, I’ve come to realize that some strategies and tactics respond to multiple objectives. Moreover, a strategy generally has a longer shelf life than the tactics put in place, and the objectives that evolve with the company. Between expectations and resources deployed! Measurement: Measuring, testing, and adjusting is still the most effective way to achieve your objectives, especially given the opportunities for measurement available on the web today. Which version do you prefer? The table or the infographic?